This week we’re looking back at some great beers we’ve had recently and chatting about what it means for a beer to be “on trend”. Hopinions | Should beers in a brewery’s core range change to stay on trend? 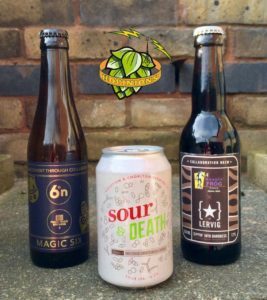 We’re grateful to Matt at Six Degrees North for sending us ‘Magic Six’ . The fact that we were given this beer for free did not influence our thoughts on it. This was my Friday night. The wait was excruciating. But finally, it was Saturday morning and time to depart on my trip to Edinburgh and the Scottish Real Ale Festival. I’d been looking forward to this day for weeks. And what a day it would be. I arrived in Edinburgh just after 11am and headed to my usual first stop, The Beer Hive. After a quick chat I purchased a bottle of Magic Rock’s Salty Kiss (which I’m drinking as I write this: WOW), I headed off to my second port of call: The Hanging Bat for a pint with Elusive Brewing’s Andy Parker. Andy is a home/pro brewer, and although I’ve never tried any of his beers, everybody I’ve seen who has raves about them. I’m very excited to try the IPA he gave me. (Tried it by the time I edited this piece: WOW!) We had a lovely chat about brewing and beer and he had to shoot off, far too soon for my liking, to the next event of the European Beer Bloggers Conference. Andy is a great guy so you should all keep your eyes and ears open for whatever Elusive Brewing has planned next! If you’re reading this Andy, cheers for the company and the beer. After Andy left I finished off the beer I was drinking, a Saison 14 from Weird Beard, which was fantastic, and quickly ordered a Citra by Brodies. A fantastic beer and packed full of flavour for only 3%. As nice as it was though, I found it far too warm. Probably a result of the ridiculously warm weather we’ve been having recently. And with that beer finished, it was time to head to SRAF. Until I noticed on Twitter that @stravale was just round the corner from me. I invited him to join me and we stayed in the Bat chatting to Adam of Walking and Crawling for a little while. 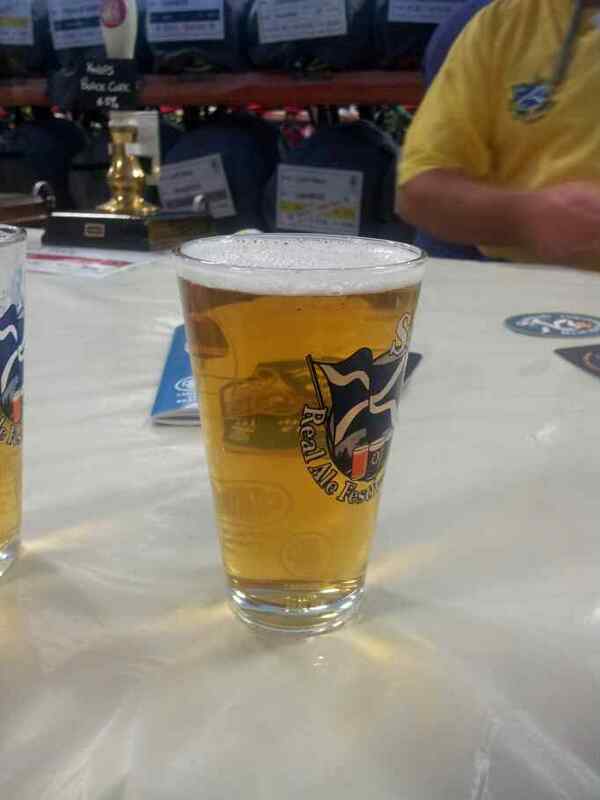 He told us that he had just been to SRAF and was disappointed, but I was still looking forward to it as it was my first big beer festival. A short while, and a bus journey later, myself and @stravale were making our way into the Edinburgh Corn Exchange where we would find over 150 cask ales on offer. After paying our entry fee and picking up our glasses, we made our way through to the hall. I went straight for the Elixir Fremantle Doctor. A lovely beer, maybe a bit too heavy on the bittering for me but a great beer nonetheless and one I definitely want to try again. After that I tried out Fyne’s Sublime Stout which I didn’t like at all. I can’t put my finger on what it was, but unfortunately it ended up down the toilet sink. There was no way I was wasting time on beer I didn’t like, especially on a day like today. After that we both headed over to the Natural Selection cask and tried it’s Origin. I’d been really excited to try this and I have to admit I was a bit disappointed. It didn’t have any of the Belgian yeastyness that you expect from a saison and as it was cask it wasn’t as carbonated as I would have liked. I’m glad I got the chance to try it and I’d definitely like to try it on keg or in bottle. Not long after that we started chatting to a random guy at the bar. Turns out he was one of the judges of the Champion Beer of Scotland! Very cool. Which then inspired us both to have a half of Jarl, the new king of Scottish beer. Lovely, lovely beer and like Citra from earlier, one that really packs a punch despite being relatively low in alcohol. Being all beered out by this point, probably due to the heat, we headed outside and grabbed a drink of water and some food. Being a bit disappointed with the festival, we decided one more beer before heading: I went for Old School by Six Degrees North which was ok but nothing special. Kind of sums up SRAF for me. The beers were nice enough but I don’t think they were conditioned long enough and they weren’t being poured very well. I also think it’s awful that all the best beers are already gone by Saturday. Would it be hard to get more or not put them on until Saturday? I can only assume Saturday would be their biggest day. A lot of these thoughts were echoed by the barman in The Bow Bar, who suggested getting some professional cellarmen in to look after the beers and possibly delay opening until Friday to give the beers a bit more time. This festival is supposed to be the pinnacle of cask in Scotland and quite frankly, it’s not. After the festival, @stravale headed home and I headed to The Bow Bar. This was my second new bar of the day and after finding it surprisingly easily I headed in to peruse their selection. I noticed a couple Weird Beard beers on, but I quickly decided on the beer that I came for: the Buxton / To Ol collaboration, Sky Mountain. This was my first ever Berliner Weiss and only my second ever sour so I was eager to get stuck in. Boy, did it not disappoint. It was fantastic. Just sublime. So good I ordered another third before moving onto another beer of what must be today’s theme: small, flavourful beers. This time it was Little Things That Kill by Weird Beard, and just like the others it was packed full of flavour, just brilliant. While I was drinking this I got chatting to a guy at the bar who just happened to be a published writer. Woah! Don’t think I’ve ever met a published writer before so that was kinda cool. He’s a lecturer at the university and wrote a book on 18th Scottish history. After getting a bottle filled with Weird Beard’s 5 O’Clock Shadow I made my way back to The Hanging Bat. Being a wee bit hungry I opted for some food: their pulled pork. And bloody hell, it was amazing. You get a box filled with the pulled pork and a wee roll to put it on. I smothered it on the roll rather liberally and still had enough left in the box for a good few scoops. One of the tastiest things all day! I washed that down with a Bethnal Pale by Redchurch and waited to meet Andy Parker again, having a Diablo by Summer Wine Brewery with Andy, Andy of Summer Wine and two other beer enthusiasts whose names I can’t remember (sorry!). Diablo was a brilliant beer and drinking such a fantastic beer with the guy responsible for it was a great finish to my day. After that I headed to the train station, completely exhausted from my eventful day. I even fell asleep on the train, helping make the journey a bit shorter. When I got home I went straight to bed, dreaming of the next time I could grace Edinburgh’s fine streets and bars.